Last Saturday I embarked on a ride/event that has been in my consciousness ever since I have owned a Brompton. I should have done this ride twelve months ago but wrongly positioned cleats induced much knee pain and trying this ride then - however much I wanted to - would have been plain stupid. 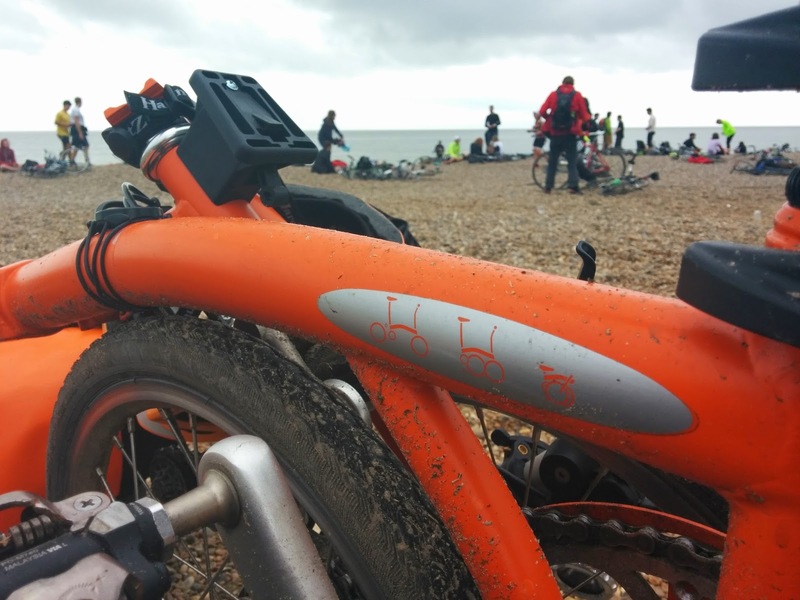 The ride, event in question is the famous Dunwich Dynamo and last Saturday night, Sunday morning would prove to be a few hours I would not forget in a hurry. 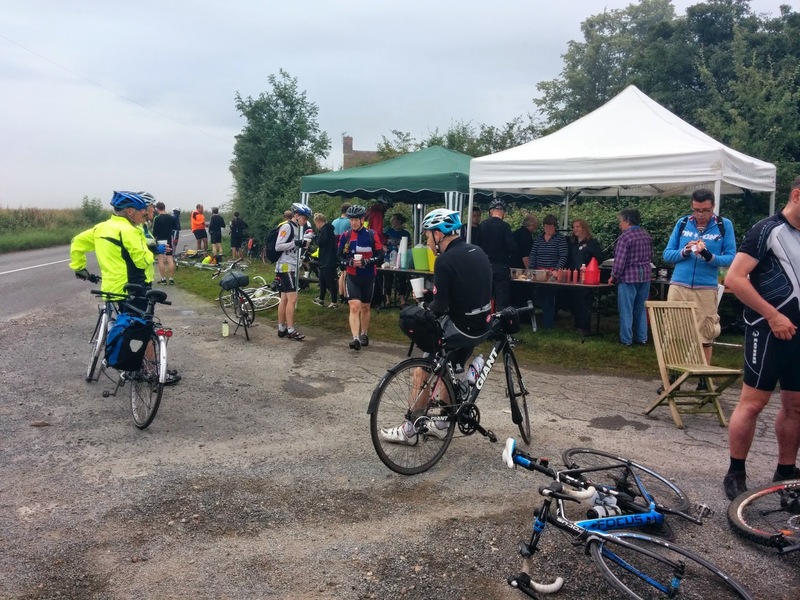 The Dunwich Dynamo started back in 1993 when a group of bicycle messengers left London for the Suffolk coast on fixed wheeled bikes. Since then it has grown in popularity attracting more and more participants. The week leading up to the Dynamo I didn't really have a great deal of time to dwell on the prospect of cycling 112 miles on a Brompton. It was hectic at work and this meant thoughts of the Dynamo were our firmly to one side. 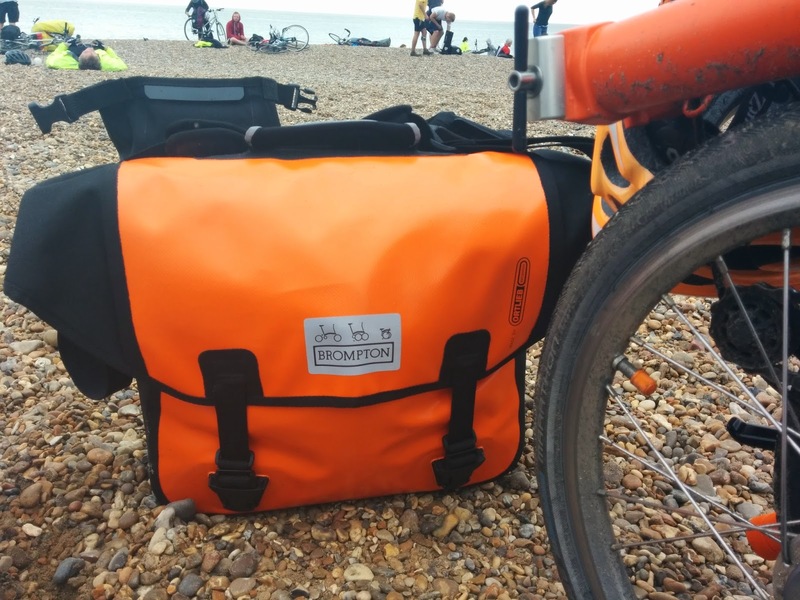 With only one Brompton to use I took my Titanium Orange Brompton. If my new Brompton had of been around I would have taken that but as it wasn't I had no other option. I packed as light as I could but had to forgo the Mini O bag in favour of its bigger brother the O bag. (I am really glad I did but more on that later). My main concern was water and fuel. I wanted to be more or less self-sufficient and stop only when necessary. I was riding with Geoff and a work acquaintance of Guy called Richard. 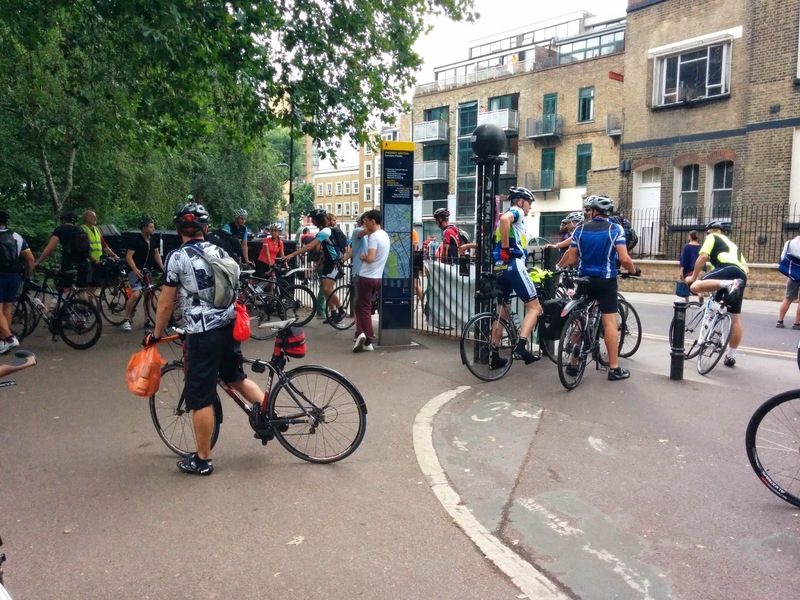 The meeting point was Liverpool Street Station and instead of getting the tube there, I cycled. In doing so I clocked up close to 12 miles in the way of a warm up. Of course I got lost and had a concerned Geoff on the phone enquiring where I was. I knew I was nearby but when Google Maps indicated that I had in fact reached my destination, it dawn on me that Liverpool Street Station was across the road! As the three of us set off for the official start at Hackney Fields it started to drizzle. Was this an omen of what was to come? It was on our way to the start I learnt that my Partner in Crime, Andrew was not coming to see us off as planned. Unfortunately, Andrew was unable to get time off work to participate in the Dynamo and didn't want to have to take off a couple of valuable days holiday. This was a shame as I suspect he would have enjoyed it. The start was busy and there were a nervous tension in some riders. You could see it on their faces, in unsure glances and in small talk. I didn't feel that nervous at all as I didn't really know too much about the route other than the milage and felt prepared physically and mentally. Without a great deal of fuss we headed to the blue bridge that marked the unofficial, official start at about 20:10. Cycling off with all manner of bicycles left, right, forward and behind we formed a neat little pack. It reminded me of watching the Tour on television. Initial miles getting out of London were slow and one had to keep ones whits. There was sudden braking, overtaking on the inside and generally selfish cycling. 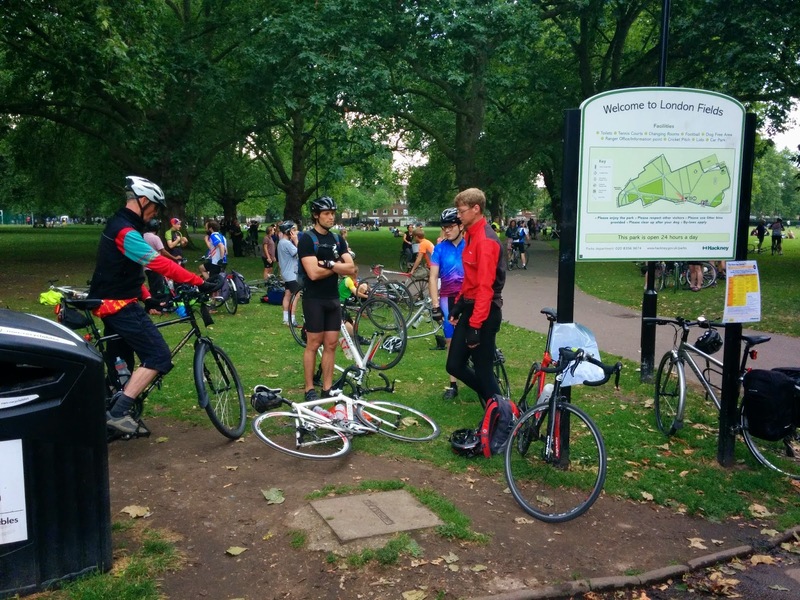 I was glad when we eventually reached Epping Forest as we thinned out and had more space. Geoff and I didn't go mad with the pace. With hindsight we could have gone considerably faster and not suffered any ill effects but it wasn't a race and for my first Dynamo I was happy to conserve energy just in case. 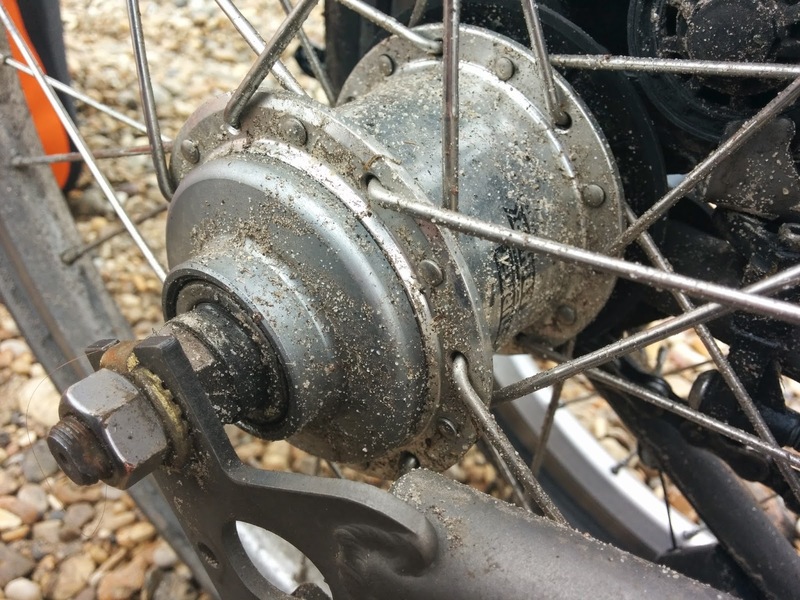 As we cycled along several roadies commented on the fact that I was attempting the Dynamo on a Brompton. They thought I was crazy buy admired the fact I was not only doing it but maintaining a good pace. Many of them were hoping to complete the run in under seven hours. When they said their goodbyes they accelerated off into the distance and their speed was nightly impressive. About about 22:30 the heavens opened. This was a torrential downpour and looking skyward the rain was so heavy it stung my face. Realising that we had better take sanctuary, we found the garages of some flats and laid up until the worse of it was over. 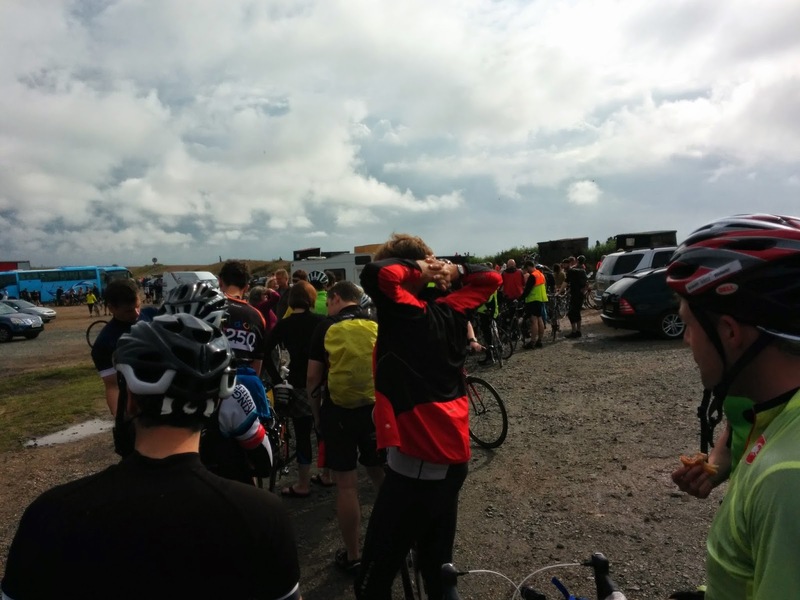 We were joined by other cyclists who sensibly decided to wait things out too. Unfortunately, it was the point at which we lost Richard who had been a little further back. Setting off after a few minutes we had waterproof jackets on but felt hot in them, it being a rather hot and humid affair. Thankfully, as traces of rain disappeared we were able to get rid of them. 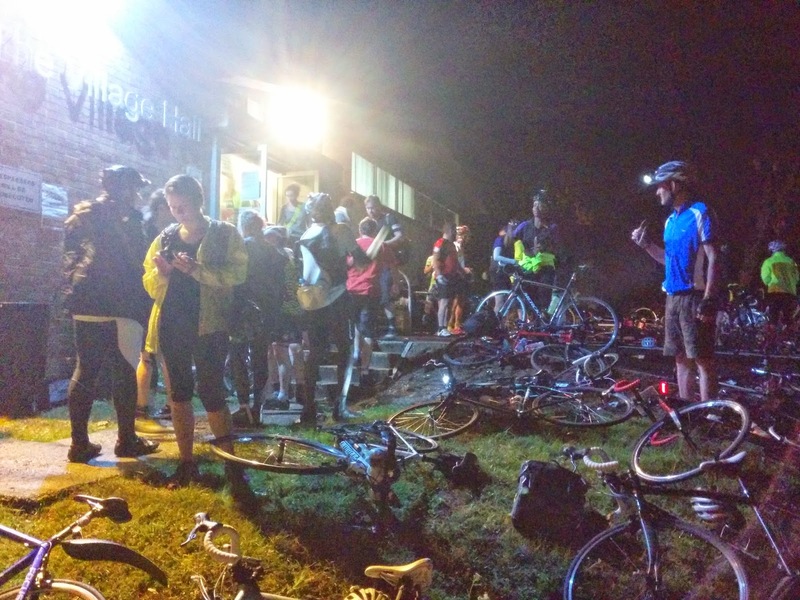 At midnight I reached the halfway stop at more or less 50 miles. This surprised me as we had made excellent pace in such a short space of time. I reached this point alone as unbeknownst to me Geoff had suffered a rear wheel puncture. Richard rolled in not long after and with a text from Geoff we decided to wait for him. Roughly 45 minutes later we were off again for the final push. As we cycled by we saw little candles, lit and strategically placed by persons unknown at critical junctions. They were rather pretty and a welcome sight. As the night was still, they weren't blown out and must have lasted for many hours. As we cycled along for the next few hours we lost Richard again and were not to see him again for the rest of the ride. This was unfortunate as we had hoped to stay together. Geoff and I maintained a good pace together but he started to go into the distance and I lost sight of him. I was defiantly getting slower and the cycling felt like hard work. I was starting to feel real tired so I stopped to have an energy bar and take on some water. A fellow cyclist past me and shouted, 'flat front tyre.' Having a look at my tyre, it was indeed very flat. Not wishing to put some air into it and see it that would do, I had the wheel off and replaced the inner tube. Examining the old one I could find nothing wrong and the tyre looked good too. I suspect there might have been something wrong with the value? Feeling quite proud of myself for changing a tyre 'in the field' I set off. Instantly things felt much better and normal service was resumed. It was not long before I saw Geoff and we were to remain together for the rest of the ride. 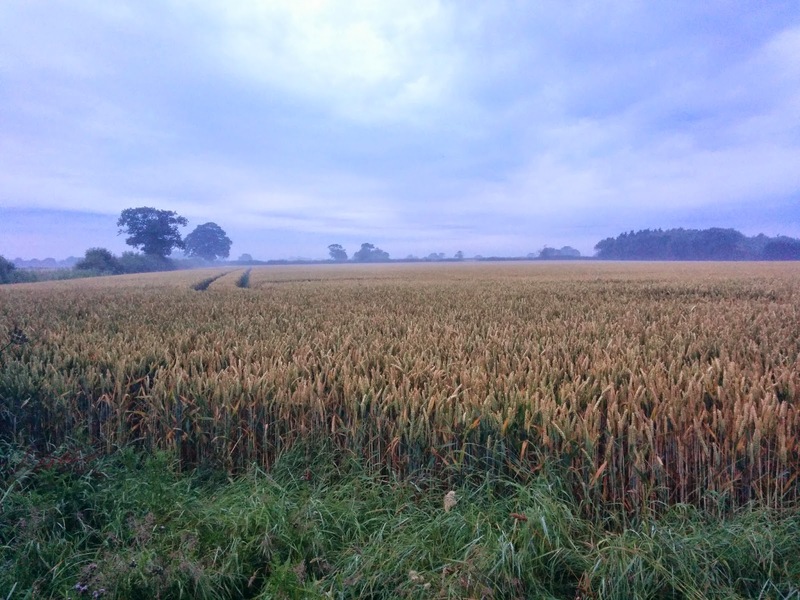 The early hours of the morning were as beguiling as they were beautiful. A myst covered the countryside like white blankets draped over old furniture. The dawn chorus began and birds competed in their quests for the greatest song. At 97 miles Geoff and I stopped at one of the many roadside refreshment points for a bacon roll and a mug of coffee. This was like food from the Gods. Feeling pretty good for having cycled 97 miles, on a Brompton through the night we pressed on for the finish. At almost 112 miles we reached the end at about 07:45. We had done it. 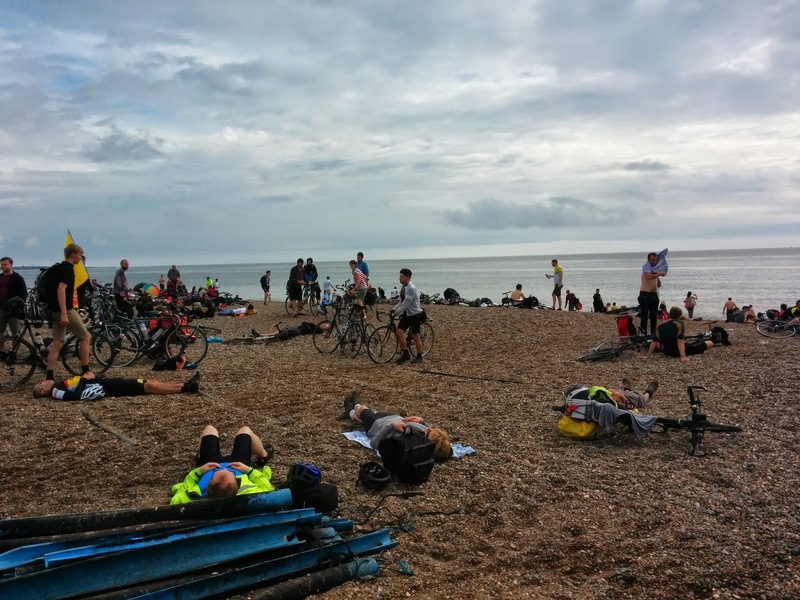 The Dunwich Dynamo had been completed. A long term goal had been realised. There were not medals, no photographers to take your picture to view/buy online later...just the satisfaction of completing an organic cycling event. Geoff's coach was off pretty quickly and we said our goodbyes. It was great cycling with Geoff. This was his second Dunwich Dynamo and I am not sure I could have done it without him. I was using a different coach company and had to wait in line for some considerable time to see what time my coach would leave. Eventually I found out I was on the noon coach. Retiring to the beach, not overly impressed I sat gazing out to the sea. This was the part of the ride I did not care for. I wanted to get home, see my wife and family, tell them about my adventures and that I had completed the Dynamo on my Orange Brompton. No...I sat on a beach watching people (who in public should be fully clothed at all times) discard their clothing for a dip in the sea. 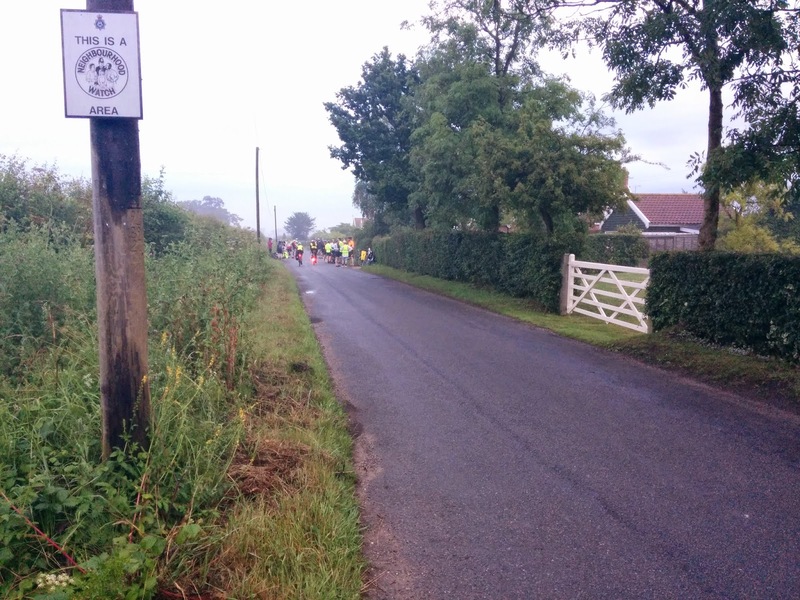 Not long afterwards and feeling slightly less truculent, I saw a few more familiar faces from the Brompton Club. 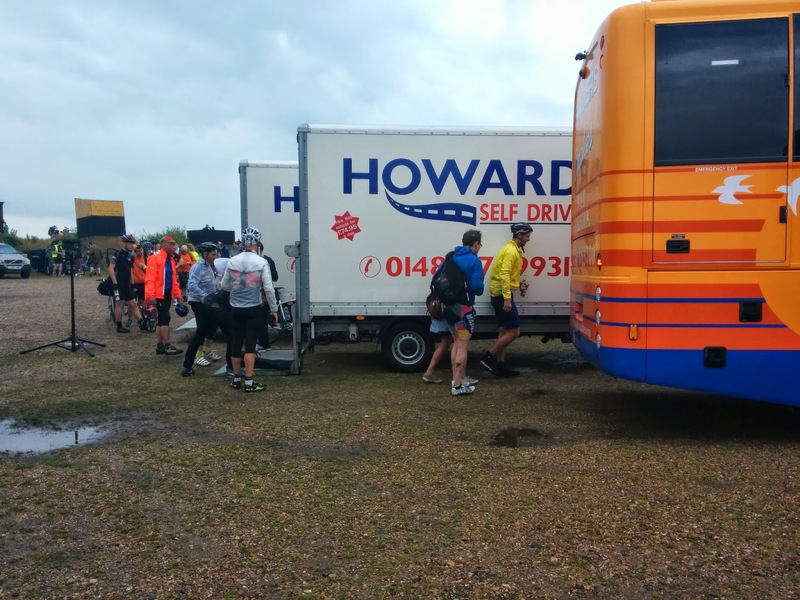 They had done the Dynamo too and the sense of achievement and general happiness at compelling the 112 miles was obvious. A couple of people came up to me enquiring if I was that Orange Brompton chap. It was nice to meet the readers of my blog, if not rather surreal. My orange O bag proved to be worth its weight in gold. My intention was to travel ultra light but I was unable to carrying wet weather gear, food and water. At no point did I feel it slowing me down and I ended the ride totally loving it - more that I already did. Added to this was the fact that I had total confidence in it waterproofing prowess. Just after 11:00 and having enough of the beach I headed for the coach park. I was able to place my Brompton, folded in the coaches boot. The driver was excellent and cardboard was placed around it so it wouldn't get scratched. Retiring to a seat on the coach I waited for noon and departure. We left on time. I have very few memories of the journey home. At points I woke up from my slumber to look round and see all fast asleep. I awoke for the last 10 minutes and at 14:40 we arrived back in London, in Southwark. I wasted little time and set off. By the time I reached my car I had cycled getting on for 150 miles (including my cycle to the meeting point, the Dynamo itself and then this journey). When I got home I felt as if I needed some sleep but the legs felt fine. The next day I felt fine too and was able to cycle to work as normal. I suspect that going on lots of Friday night rides to the coast and some of the longer rides this year have all helped. In the build up to the Dynamo I changed my mind about whether or not I would be going several times. I am glad that I did. In my book there is little point sitting around saying you'd like to do something and then back out. Any ride of 100 miles plus is demanding and the Dynamo was the longest single ride I have ever done. This is now the second time this year I have ridden over 100 miles. I suspect there will be more. Would I do it again? When I was waiting in the line for coaches and then sitting on the beach no. When I was on the coach, falling asleep and waking up no. When I reached London and had to cycle even more, no. When I reached the car and was driving home and got home, maybe. The next day commuting to work on my Orange Brompton, feeling pretty good, yes. The only caveat is that I would need to find some riding partners able to cycle at a decent pace - not too slow and not too fast. The Dynamo would be a lonely affair on ones own...but I wouldn't rule it out totally. 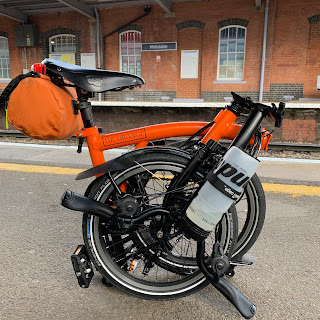 (If I do it next year it will be on my new Touring Orange Brompton which might well be being build as I type this blog entry. More on that though, when it arrives). Many thanks to Geoff and Richard for the company and I hope that we can all find the time to do it again next year. Orange Brompton, wow amazing distance. 112 miles! 150 Miles in sub 24 Hours. Remarkable and congratulations to you. Thoroughly enjoyed this post. The details were terrific. I can't wait to see your touring Brompton. Mr.O - You passed through Sudbury, birthplace of Thomas Gainsborough and my hometown at an un-earthly hour and I commend you for it ...... good show. There's some superb Brompton cycling to be had in the area and the countryside hasn't changed much since Constable's time. My New Orange Brompton is Here! !